Deck Restore+ is a brand of deck cleaning agents used by contractors and residential household alike. In prior years, Deck Restore+ was only available to professionals through direct supply. Now, through Master Decker, Deck Restore+ is made available to every homeowner. Restores old, weathered, and greying decks to their natural appearance with just one coat. Clean up to 600 sq. ft. of heavily dirty deck,fence,pergola with just one canister. Easy to use – just mix with water and apply using a mop or garden sprayer. Professional results, without the professional price tag – by using and applying the product yourself save hundreds of dollars maintaining your deck. Deck Restore+ is recommended for outdoor applications and is safe for your plants and shrubs. Are you planning on sealing/staining your deck in the future? Want to bright colour of a new deck? 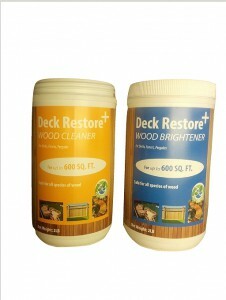 Make sure to pair the Deck Restore + Cleaner with the Deck Restore + Brightener to achieve the best results. The Deck Restore + Brightener allows the seal and stain to adhere, while also giving your deck a brighter, and newer appearance. Both can be purchased as a package. Find out why Deck Restore + is one of the fastest growing deck cleaners on the market by contacting one of our associates.